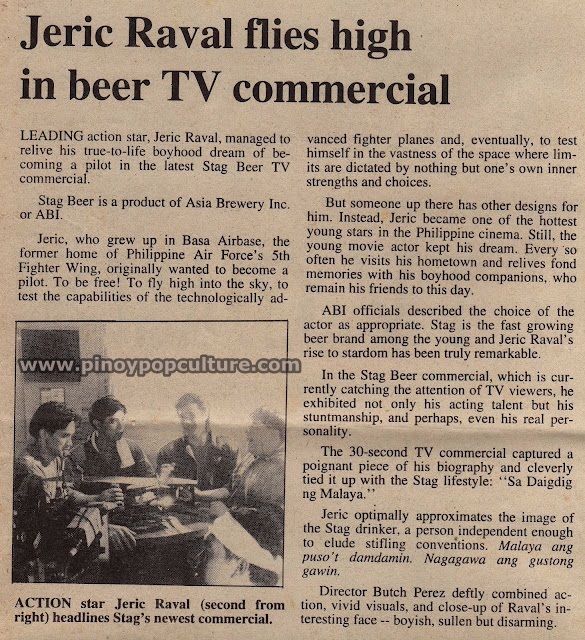 The April 24, 1994 issue of the Philippine Daily Inquirer had an article about action star Jeric Raval's endorsement of Stag Beer, a brand manufactured by Asia Brewery Inc.
Jeric Raval, born Jericho Buensuceso, was a contract star of OctoArts Films. He is known for starring in movies including Boboy Salonga: Batang Tondo, Biboy Banal: Pagganti Ko ... Tapos Kayo!, and Bunso: Isinilang Kang Palaban. It can be noted that the caption did not mention that actor Richard Quan is situated second from left in the photograph. Our backyard has a wide variety of fruit-bearing plants, one of which is the calamansi or calamondin (Citrofortunella microcarpa). Calamansi fruits have many uses. The juice from the green fruits of this shrub can be made into a refreshing beverage. Other culinary applications include the combination of the juice with condiments such as toyo (soy sauce) and patis (fish sauce). As a laundry aid, the juice can also help in removing stains from clothes. Lately, many of us have been experiencing the hot weather in the Philippines, which tells us that summer is on its heyday. Now that I'm of working age, summer reminds me of those times that I have a long vacation from school every year. In the 1991 film Juan Tamad at Mr. Shoo-Li sa Mongolian Barbecue: The Movie there is a hilarious scene in which Tong-ressman Manhik Manaog (played by Leo Martinez) convened the citizens of the newly-independent country of Lawa-Lawaan. After the Independence Day celebrations, the country faced the challenge of forming a leadership comprising its citizens. Manhik Manaog lectured representatives from various parts of the country about the rudiments of democracy. He explained the political system by interpreting the quote "Democracy is of the people, for the people, and by the people." With "of the people," Manhik Manaog meant people who, like him, are intelligent (or cunning) enough. He changed "for the people" into "poor people." Now comes the "by the people" part: Manhik Manaog replaced "by" with "buy." Democracy, essentially in Manhik Manaog's words, is buying the poor people so intelligent (or cunning) officials like him will remain in power. On the other hand, Juan Tamad is being hounded by his debtors. In order to pay his debts, the debtors convinced Juan to run in the elections as Tong-ressman. They believe that if Juan wins, he would be able to pay his debts. These funny situations resonate well in Philippine politics, isn't it? Every Good Friday, the Crucifixion of Jesus Christ is re-enacted in Kapitangan, a village in the town of Paombong in the Philippine province of Bulacan. The area below the platform where the crucifixion was packed with people. I only managed to take the video about 100 meters away. The New Generation Banknote Series of the Philippine peso were released in December 2010. Among these banknotes, the 20-peso and the 200-peso bills gained my interest. John Lloyd Cruz and Angel Locsin starred in ÜnOfficially Yours, the recent blockbuster from Star Cinema. In this film, Macky (played by Cruz) is a young man who had a one night stand with Ces (Locsin). They later met at the office of a newspaper company, when Macky found work as a reporter. Ces trained him on the rudiments of journalism. Sorry to disappoint other readers, but I'll not delve into the juicy details of the movie's plot. I will discuss something we see everyday. The title of this post might indicate a misplaced article, but it is not. The importance of English in Filipino culture cannot be understated considering that it is one of our official languages. I would like to share with you two Oscar-winning films that delve on how to properly speak in English: My Fair Lady and The King's Speech. My Fair Lady is a 1964 musical film adaptation of the similarly-titled stage musical by Frederick Loewe and Alan Jay Lerner. The film's title character, Eliza Doolittle, is a Cockney flower girl who is provided with speech lessons from the phoneticist Henry Higgins. The lessons were given after Higgins' friend, Colonel Pickering, wagered that Higgins will fail on passing off Eliza as a duchess at an embassy ball. The King's Speech is a 2010 historical drama film about the struggle of the King George VI to overcome a stuttering condition. With the help of Australian speech therapist Lionel Hogue, the king successfully gave his radio broadcast on Britain's declaration of war on Germany in 1939. Both films depicted montages of the title characters having their speech lessons. The scenes resonate within me very well, because I am exerting efforts to improve my oral communication skills in English. I presume many other Filipinos can relate with my goal to become confident in speaking in English, and the films I mentioned can provide insights into the beauty of the language. Two hundred and twenty-four years ago today, the life of the great Filipino poet Francisco Balagtas (born Francisco Baltazar y dela Cruz) began in the barrio of Panginay in Bigaa (now Balagtas), Bulacan. 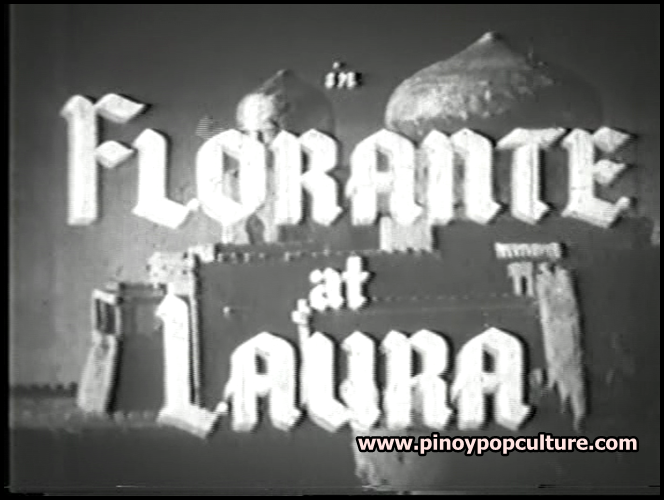 Balagtas ventured into a wide array of literary genres with the epic poem Florante at Laura standing out. The plot of Florante at Laura may be a nearly-perfect material for a movie or television screenplay. It is as colorful as the life of the author itself, which will be tackled in a future blog. A tale of romance blends with a story about political usurpation and redemption. In 1949, the Philippines' LVN Pictures made a movie based on this work by Balagtas. The significance of the work may resonate in these times of religious intolerance: It highlights the friendship between Florante, the Albanian duke, and Aladin, the Persian prince. Many educational institutions in the Philippines set Florante at Laura as required reading for the secondary curriculum. An e-book version of this work may be accessed on the Project Gutenberg Web site.